A momentous Rugby League season will reach a dramatic climax for Kingstone Press Championship, League 1, National Conference League and Conference League South clubs with a triple header of finals at Widnes on Sunday October 4. The Select Security Stadium will host the season-ending Kingstone Press Finals Day when glory will be up for grabs by clubs from the sport’s second, third and fourth tiers. The action kicks off at 11.30am with the Conference Challenge Trophy final and continues with the Kingstone Press League 1 play-off final at 2pm. What is sure to be a memorable day will end with the final of the Kingstone Press Championship Shield at 4.30pm. RFL Chief Executive Nigel Wood said: “The new league structure has gripped the imagination across all competitions with more unpredictability of outcome than ever before and the Kingstone Press Finals Day will make for a fitting finale to a season where every minute really does matter. 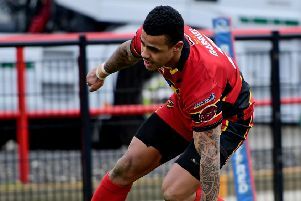 “Following on from the success of the Summer Bash and Magic Weekend, the Kingstone Press Finals Day has all the makings of another terrific festival of Rugby League. The Conference Challenge Trophy is contested by clubs in Rugby League’s Tier 4 – the National Conference League and Conference League South. The League 1 play-offs involve five clubs and will determine the second promotion place to the Championship for 2016. At the end of the regular season, first will play second for automatic promotion as champions. The loser of that match then join the clubs that finished third, fourth and fifth in the play-offs. First or second will be at home to fifth and third at home to fourth with the winners contesting the League 1 play-off final at Widnes. The Kingstone Press Championship Shield final will involve two of the top four teams from the Championship Shield – the third of the Super 8s that will be created when the 24 First Utility Super League and Kingstone Press Championship clubs split into three groups at the end of the regular season. First will play fourth and second will host third with the winners going through to the Championship Shield final for the chance to end the year with a trophy lift. Details of ticket prices and availability will be announced shortly.